It is not long since the country is bestowed with Honda’s latest offering and the sedan which has ruled not only the Philippines road, but global as well, the refreshed styling and upgradations have turn out to be exceptional this time. Here are some key factors of 10th generation Honda Civic, which makes it a stand out sedan in the segment. Honda Civic has always carried a distinct style quotient to remain a center of attraction. The 10th generation Civic is no exception. The all-new Honda Civic reflects a modern yet elegant touch that has worked perfectly to attract the customers in an effective manner. The well sculpted hood, revamped bumper, LED headlamps, and radiator grille all together imparts a refreshed appeal. The side profile has been also received some changes which include perfectly mounted fenders, body colored door handles and multi-spoke alloy wheels. What has attracted people the most is the Civic’s sporty rear which now features C-Shaped taillights which blends with tailgate seamlessly. Along with exterior, the interiors have been also refreshed to give a sporty feel to the occupants. The stretched out wheelbase works out perfectly for providing a comfortable seating position for all the occupants while the soft upholstery and cosy seats makes the overall ride all the more enjoyable. On the entertainment front, the manufacturer has fitted a 7-inch touch display system, TFT instrument panel with Bluetooth wireless phone connectivity. Under the well sculpted hood lies a 1.8-litre engine which churns out a maximum power output of 141 PS and peak torque of 174 Nm. The same engine was also present in the previous generation. The new Civic is also offered with a 1.5-litre turbo mill which is further coupled with Earth Dreams Technology for better efficiency and delivers 173 PS maximum power and 220 Nm peak torque. The improved performance of the sedan is further ensured by the light body structure, as the overall weight is reduced by upto 30 kgs. Along with distinct styling and advanced features, the Japanese automaker has also worked hard on improving the safety rating of the sedan. The all-new Civic is based on G-CON + ACE structure which is well known for absorbing high shock and energy capabilities. Further, the wide and low platform offer the sedan with a class apart crash safety by enhancing the torsion rigidity in an effective manner. The other significant safety features of the sedan include Anti-Lock Braking System (ABS) with Vehicle Stability Assist. Dual front, side and curtain airbags. 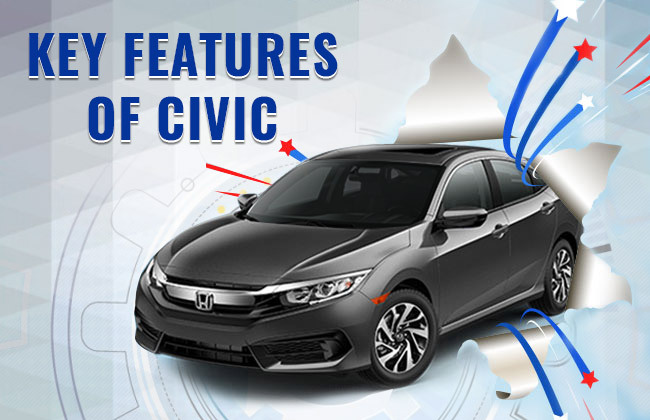 These are some of the key features of the Honda Civic, which makes it different in the lot.